Taipei, Sept. 12 (CNA) A lone migrant worker stands on a street in Taipei, while melancholy music plays in the background, in the opening scene of a short film that won a prize in a migrant workers' video competition on the weekend. 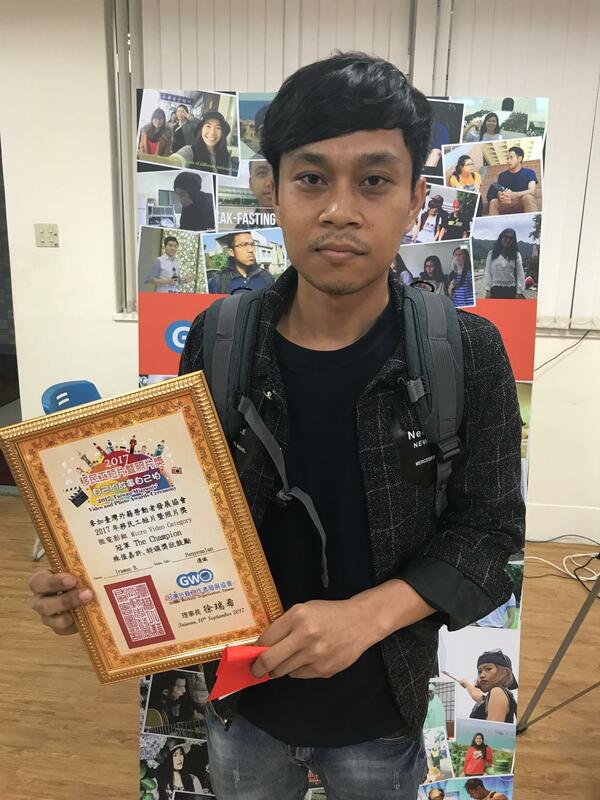 "Penyesalan" ("Regret"), a 3-minute film, was judged the best entry in the micro video category at the Taiwan Migrants' Video and Photo Awards ceremony on Sunday. The film, made by Indonesian Irawan Binantaka, is about a migrant worker in Taiwan who gets lost in the twilight world of drinking and gambling. Irawan, who works in a factory in Taoyuan, told CNA he made the film to warn arriving migrants not to waste their time on self-destructive habits like drinking and gambling, but rather to engage in positive activities. "Many migrant workers forget that their purpose in Taiwan is to earn and save money to take back home," the 28-year-old worker said. "They drink and gamble, and when their work permits expire after three years, they find themselves with no money." Irawan received a cash prize of NT$12,000 (US$399) for his film. Now in its third year, the Taiwan Migrants' Video and Photo Awards encourages migrant workers, students and immigrants from Southeast Asia to tell stories of their lives in Taiwan. "We hope migrant workers will give voice to their own stories so that Taiwanese can learn more about the lives of such workers in Taiwan," said Karen Hsu (徐瑞希), head of the Global Workers' Organization, Taiwan, which organizes the competition. This year a total of 73 entries were submitted to the competition in three categories - photo story, citizen report and micro video. Cash prizes ranging from NT$2,000 to NT$12,000 were awarded for 16 videos and photos in the three categories. Many of the winning pieces featured the natural scenery of Taiwan in places like Yehliu Geopark, Fulong Beach and Bitou Cape, while some focused on issues of nostalgia and separation. "Taipei in 1 Day," a video by Indonesian student Joanika Juanda, won first prize in the category of citizen report. Joanika said she made the video to highlight the fact that migrant workers often do not have a lot of free time and usually can spend only one day traveling around Taipei. "They can still have fun in one day, so I made a quick video to show them how to have fun in one day in Taipei," she said. The video takes viewers on a hiking trip to Elephant Mountain (Xiangshan) for a vista of the Taipei 101 area and beyond. The scene then shifts to a farmers' market at Taipei Expo Park, then to the Wufenpu shopping district, where all kinds of clothing are on sale, and ends in Raohe Street Night Market. Suwarjono, head of the Alliance of Independent Journalists in Indonesia and one of the judges in the contest, said he was surprised by the high quality of the submitted works, some of which were of professional quality. Many of the entries were also selfies, which Suwarjono said was an interesting phenomenon since photographers are usually not the subject of their own works in competitions.